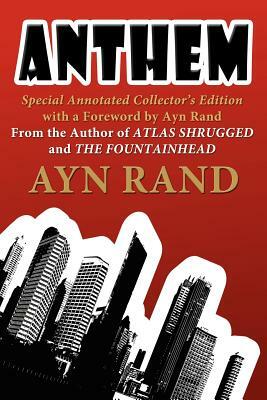 From The Author of "ATLAS SHRUGGED" and "THE FOUNTAINHEAD"
Anthem is a dystopian fiction novella by Ayn Rand, first published in 1937 in England. It takes place at some unspecified future date when mankind has entered another dark age as a result of the evils of irrationality and collectivism and the weaknesses of socialistic thinking and economics. Technological advancement is now carefully planned (when it is allowed to occur at all) and the concept of individuality has been eliminated (for example, the word "I" has disappeared from the language). As is common in her work, Rand draws a clear distinction between the "socialist/communal" values of equality and brotherhood and the "productive/capitalist" values of achievement and individuality. This Special Collector's Edition contains both the unedited and annotated versions of the Ayn Rand's book, with notes and observations for study, and a Foreward by Ayn Rand. "A compelling dystopian look at paranoia from one of the most unique and perceptive writers of our time"
"A diamond in the rough, often dwarfed by the superstar company it keeps with the author's more popular work, but every bit as gripping, daring and powerful." "Ayn Rand was more of a prophet than many people once realized."